The collapse of support for PM Netanyahu (from 82% during the ground incursion in Gaza to 38% today) was to be expected. The job of every state and head of state is to provide his/her citizens with security. If the security of the citizens is compromised, the leadership loses support. All those disappointed people, however, must understand the dynamics of their worsening security situation. If you would ask them if they believe that there is no choice but for Israel to annex Gaza and turn it into an Israeli city, like Jaffa, most would look at you as if you were hallucinating. So although there is definitely a problem with our leadership, the public is looking in the wrong place for a solution. Since Oslo, most Israelis believe that the Oslo two-state solution will alleviate Israel’s security problems. But the Oslo mentality is the root of the problem. 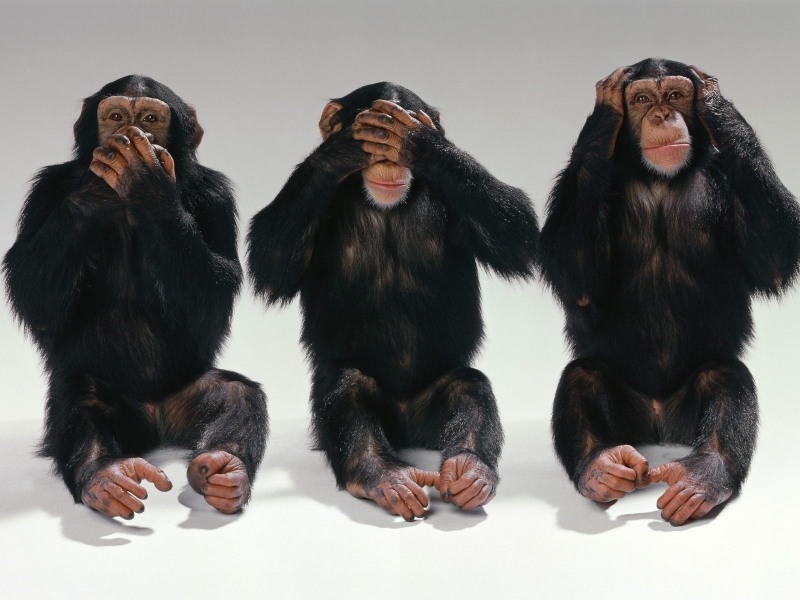 The public cannot expect Netanyahu to conjure up a solution from within this faulty consciousness. I am completely opposed to an Israeli invasion of Gaza if it is only to retreat once again or to rule colonial-style over the Arab population. I am opposed to any temporary solution that will endanger our soldiers. Israel must conquer Gaza and help its residents to emigrate. Their other option would be to live there with a solid Jewish majority. 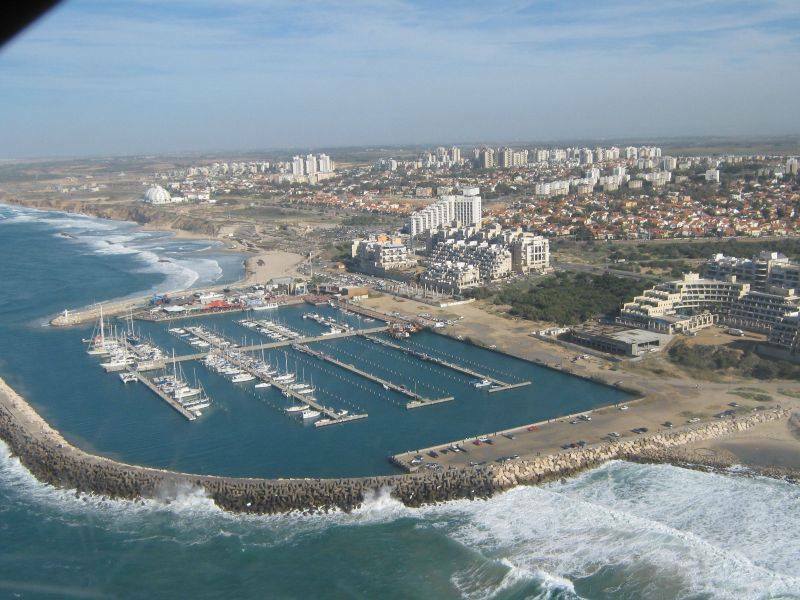 Gaza must become a thriving Israeli city – the Riviera of the Middle East – with modern tourism, high-tech and all the amenities of a modern city. This is the only realistic solution. 1. 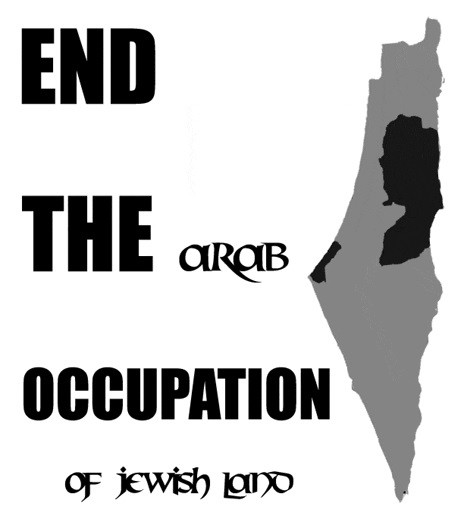 Israel must recognize that this is our land, not theirs - Gaza included. No more talk of the Oslo two-state solution. One state for one People. 2. 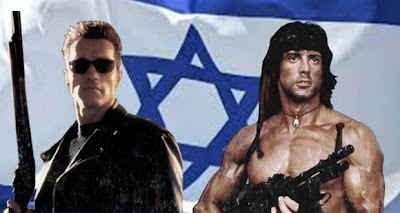 The IDF must conquer Gaza according to all the Western military doctrines. 3. Encourage and provide aid for Arab emigration. Instead of the nearly trillion shekels that Israel has invested to date in the Oslo two-state solution, we can invest in an emigration basket to allow the Gazans to relocate with financial security. Financially secure immigrants are welcomed in most countries. 4. Encourage aliyah to Israel and Jewish settlement in Gaza. 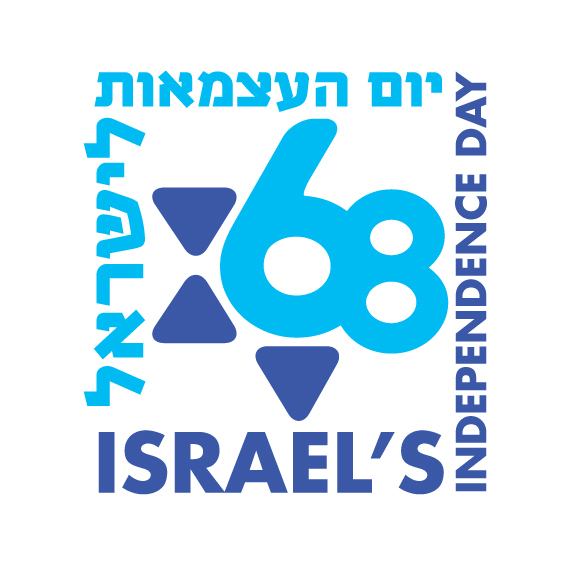 Within the next decade, we will be seeing 1.5 new Jewish immigrants to Israel. Our demographic situation is excellent. Encourage veteran Israelis and new immigrants to make their homes in Gaza and make it flourish. This is the only pragmatic, realistic solution on the horizon. To accomplish it, we need leadership that believes that this is our Land. A Hamas rocket scored a direct hit on a home in Ashkelon at about 6:30 Tuesday morning, causing light injuries to six members of the family that lives in it and to dozens of residents of nearby buildings. One of them, an eight year old boy, was reportedly injured in the face by broken glass. The rocket also caused a great amount of damage to the home and caused a water pipe to burst outside the home. The rocket reportedly slammed into the master bedroom of the home just seconds after the parents left it, to wake up their children and lead them to the safe space. Ashkelon resident John Daly recorded the moment of impact and uploaded the video to Facebook. "Two blocks over and a direct hit," he wrote. "Alarm goes off and my cat knew we were headed to film so she went to the window with me. You can hear the sound of glass shattering up and down the street from the shockwave. The 'shaking' of the camera is from the explosive force, look at the tree - it is shaking as well." 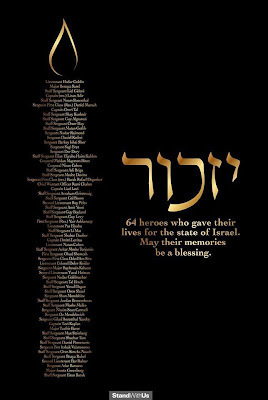 While national news outlets initially put the number of people hurt at six, Ashkelonet, a local news outlet, was among the first to report that 50 people were brought to Barzilai Hospital following the rocket attack. Of these, it said, 21 suffered light physical injuries and 29 suffered from emotional shock. This number was later corroborated by other outlets. Most of the injuries are apparently from broken glass, as the result of windows that shattered. Two Israelis died Tuesday in a mortar attack on Kibbutz Nirim, near the border with the Gaza Strip, and four others were wounded. One person was in serious condition, and three others suffered minor injuries, in the strike on the Eshkol region community. One man died while first-response workers tried to save his life. A second man was initially listed as critical but died several hours later in hospital. 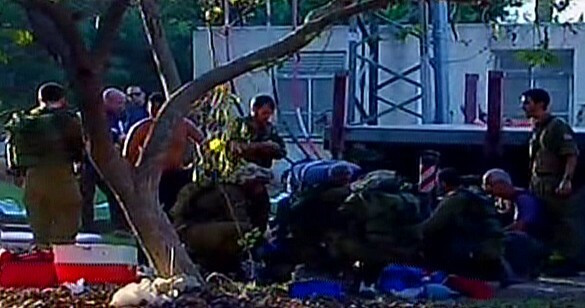 Medical care was given to the wounded as rockets and mortars fell around the kibbutz and Code Red sirens wailed. 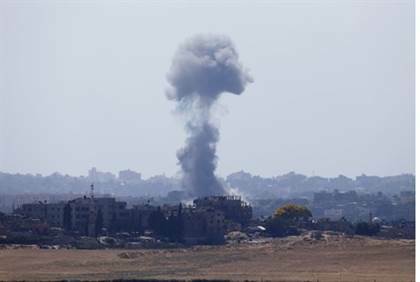 The two Israelis killed Tuesday raised the civilian death toll in Israel in Operation Protective Edge, which entered its fiftieth day Tuesday, to six. The Nirim attack came amid a fierce bombardment of the towns and communities of southern Israel in the hour before a ceasefire agreed upon by Israeli and Palestinian representatives took effect. Earlier in the day, dozens were injured in Ashkelon when a rocket fired from the Gaza Strip struck a house in the southern coastal city. 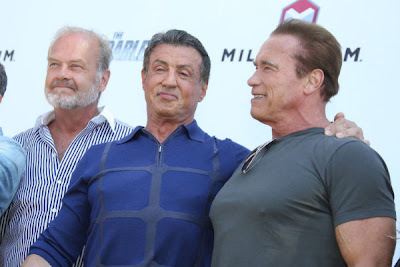 A bevy of Hollywood’s leading figures over the weekend attested to the utter failure of the attempted cultural boycott of Israel when they signed a statement blaming Hamas for the current violence in and around the Gaza Strip. In that particular clause, the Hamas charter is actually quoting from the Hadith, an authoritative collection of Mohammed's post-Koranic teachings, deeds and sayings. The statement was signed by no fewer than 187 actors, directors, writers, agents, executives and other Hollywood personalities. It was the initiative of the Creative Community for Peace. 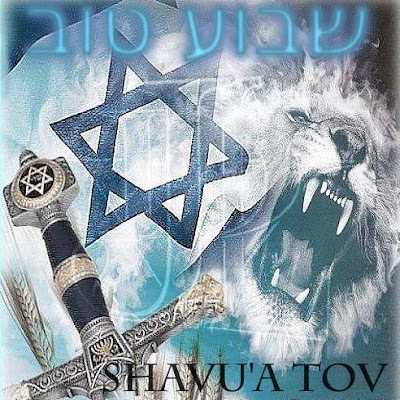 Shalom, as a Christian-Zionist I should be (and would like to be) there with you, to worship Hashem. Because for me as a believer (in Yeshua) from the gojim, it is natural to be with you (the Jewish people). Entering the Temple Mount through the Mugrabi Gate, proceeding eastward along the southern side of the Mount, various artifacts can be seen on display. While some of these artifacts date to later historical periods, a number of these items are remnants from the Second Temple period. 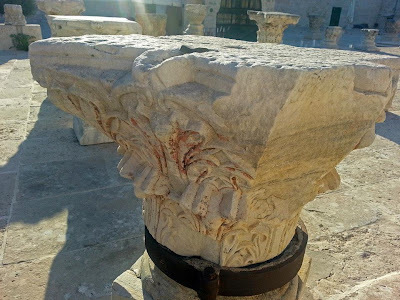 Some of the capitals (a capital is the archaeological term for the topmost portion of a column) pictured here are actually from the Second Temple. 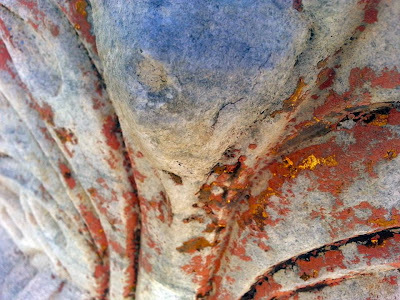 Sources of Jewish tradition and history record that these capitals were covered with an overlay of gold. 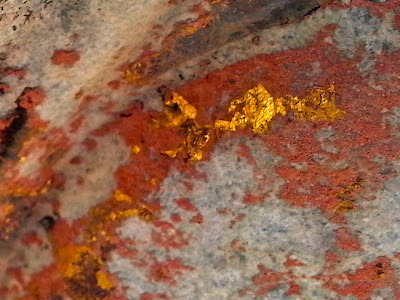 The orange-tinted stain on the stone is ostensibly all that is left, the effect of the elements on the gold over the millennium. However a closer examination of several of these capitals reveals a fascinating detail: remnants of bright gold that still remain on the capitals! Indeed, this is the legacy of "Jerusalem of Gold," and while the Islamic elements that temporarily hold sway over the Temple Mount deny that the Holy Temple even existed, and deny the Jewish connection to this holy site... the evidence of the past points brightly to the future. Photographs by Rabbi Chaim Richman. Sommige joden willen vertrekken uit de Schilderswijk. Ze zouden zich niet meer veilig voelen in de Haagse wijk. 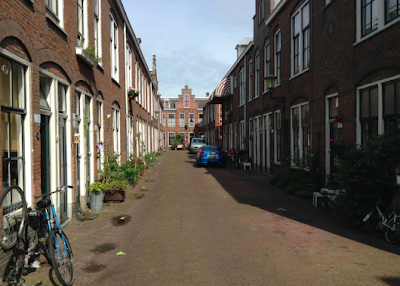 Midden in de probleemwijk is een 'joods hofje'. Veel bewoners voelen zich bedreigd door antisemitisme in de buurt en sommigen eisen dat de gemeente ze een nieuw onderkomen geeft. Dat meldt The Post Online. De joodse enclave ligt in een overwegend islamitische wijk. Vlakbij het hofje waren de afgelopen maand een paar onrustige protesten. Radicale moslims riepen antisemitische leuzen. Ook werd de Hitlergroet gebracht. Schrijver Fabrice Schomberg is een van de bewoners die ergens anders willen wonen. Hij vindt de gemeente te afwachtend. 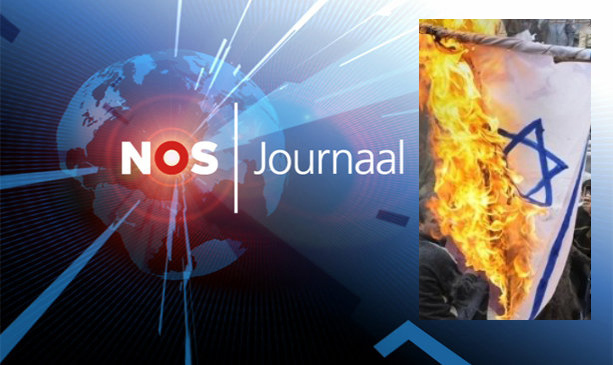 "Je moet niet naïef zijn: een deel van de jongeren radicaliseert. Ik voel me nu nog veilig, maar je weet nooit of iemand iets wil uitrichten." Gas deployed by the Israeli army gushes out of a hole in a tunnel which was used by Hamas terrorists. Deep in the bowels of Tel Aviv's underground, engineers and scientists recently conducted trials of a new hi-tech detection system that aims to eradicate the threat posed by Hamas's underground tunnels. As international pressure mounts to end the current round of fighting between Israel and Hamas, and the operation in Gaza continues to claim more and more lives, the IDF is racing against time in order to discover as many tunnels as possible. But once the IDF withdraws from Gaza, there are currently no mechanisms in place to prevent Hamas and others from digging new tunnels into Israel. In a bid to find a solution, the IDF's elite Talpiot unit has been working on developing a tunnel detection system which was tested in Tel Aviv. Its costs are estimated to be $59 million. "The high-tech system, which uses special sensors and transmitters, is still in its R&D phase, and if all goes well, should be operational within a year", notes a report on Israel's I-24 news. The most common type of technology for tracking down tunnels is focused on listening for sounds of digging, notes Inbal Orpaz in the Israeli daily Haaretz. Another Israeli company, Magna, already provides defence systems for the Israel-Egypt border, as well as for the nuclear reactor sites in Japan. It proposes digging a 70-km tunnel along the Israel-Gaza border, equipped with a sensitive alert system. This "will provide real-time alerts of any tunnel digging that crosses our tunnel, whether above or below it. 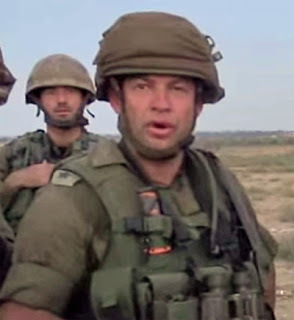 The IDF will know exactly where the attack tunnel is and how many people are in it, and can monitor the progress of digging it in real time, and decide how to respond to the threat," the company's founder and CEO Haim Siboni told Israel's Globes publication. While hi-tech solutions are being tested and debated, many in Israel bemoan the fact that such a large number of tunnels dug from Gaza into Israeli territory have gone undetected for so long. "For 10 years I've been crying and screaming to the highest possible levels - to the Defense Ministry, the chief of staff, the commanding officers of southern and northern command," Dr Joseph Langotsky, an Israeli geologist who has long advocated greater attention to the issue of the tunnels, said in an interview with the Jerusalem Post. "Although the tunnels are a low-tech option, they might be a strategic threat to our security," said Dr Langotsky. Where is the UN condemnation? A four-year-old Israeli boy was killed by a mortar shell fired from the Gaza Strip on Friday afternoon. The boy, named late Friday as Daniel Tragerman, was at home with his parents and siblings at their kibbutz in the Sha’ar Hanegev Region, close to the border with Gaza, when the attack took place. 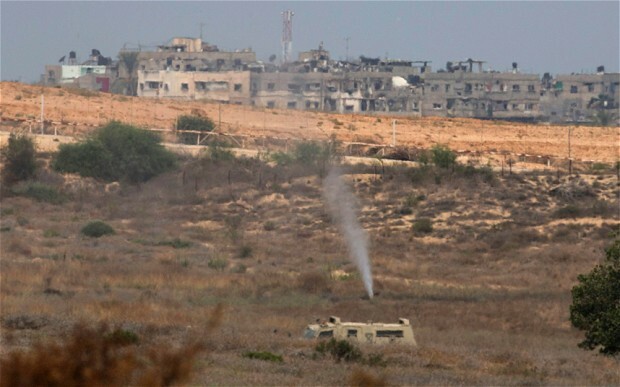 An Israeli army spokesperson said the fatal shell was fired from near an UNRWA shelter in Gaza. 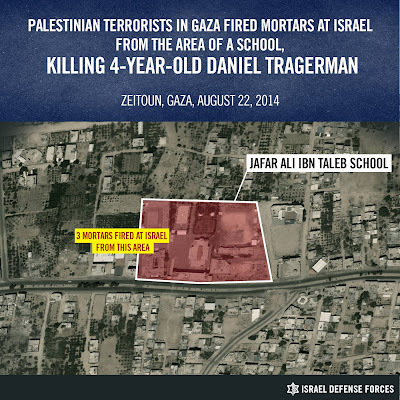 Earlier, Israeli officials had said it was fired from an UNRWA school — an asserted the IDF later corrected. 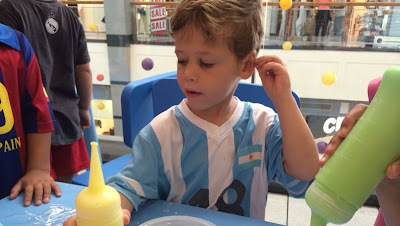 Sirens wailed only very shortly before the mortar shell struck outside the Tragerman family home at the kibbutz, and his parents — Doron and Gila — were unable to get their son Daniel into their protected room in time. He was killed by shrapnel from the explosion that smashed into the house. Daniel is the first Israeli child to die in the current Israel-Hamas conflict. 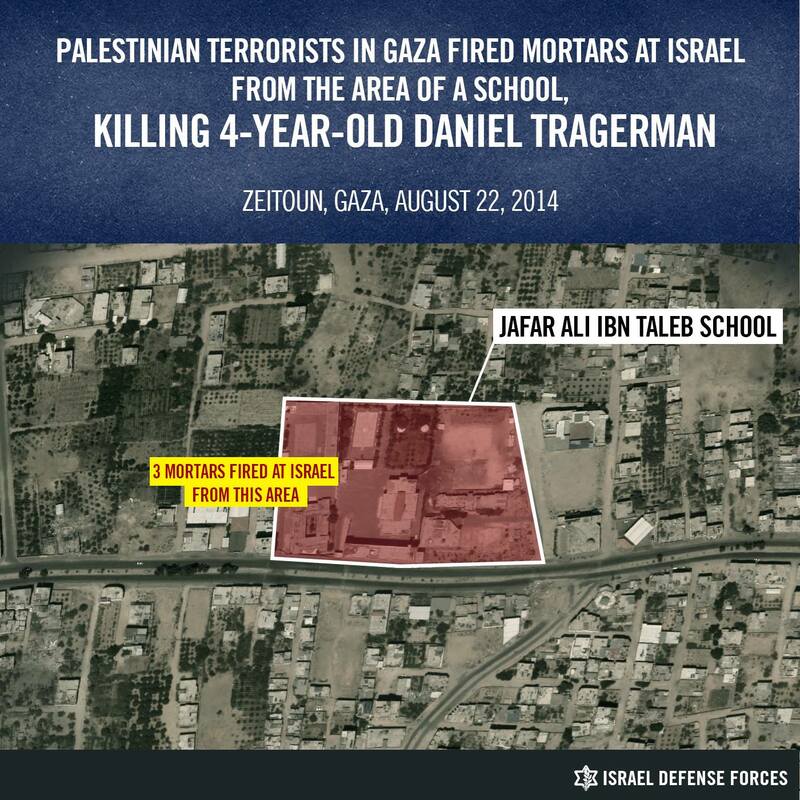 His death brought the Israeli death toll since Operation Protective Edge began on July 8 to 68. He was critically wounded, and later died of his wounds. Prime Minister Benjamin Netanyahu said Hamas would pay a “heavy price” for the killing. In a phone call to local Sha’ar Hanegev council head Alon Shuster, Netanyahu said the IDF and Shin Bet would intensify their operations against Hamas and other Gaza terror groups until sustained calm was guaranteed for Israel. Option Opinion: How to Stop ISIS?! Roughly two-and-a-half hours after three rockets were fired at Be'er Sheva from the Hamas enclave of Gaza on Tuesday in breach of the ceasefire agreed between the sides, terrorists in the area reportedly continued their fire on Israel. 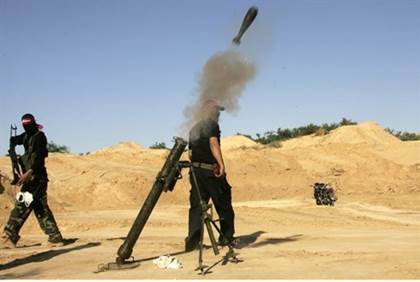 There are conflicting reports as to whether mortar shells or a rocket hit open ground in the Sedot Negev Regional Council area; there were no injuries or damage reported in the attack. All reports agree that rocket sirens were not sounded in the area before the attack hit. Just minutes after the Sedot Negev strike, "Color Red" rocket sirens were sounded in Netivot and the Gaza Belt area. Iron Dome reportedly shot down two missiles over Netivot. A third rocket reportedly hit open ground in the Sedot Negev region. Just after 8 p.m. another rocket reportedly struck open ground in the Ashdod region, causing no damage or injuries; minutes later rocket warning sirens sounded for the Hof Ashkelon Region area, right before a rocket slammed into open ground in the region. Another rocket hit the same area shortly before 9:30 p.m., landing in a shopping center and reportedly causing damage but no injuries. As the terrorists renewed their attacks, a troubling pattern was observed in the rocket warning sirens. In the first round of three rockets on Be'er Sheva no sirens were sounded ahead of the strikes. Shortly afterwards sirens were sounded in the Eshkol Regional Council area, only for the IDF to clarify that the sirens were a false alarm. In all, a total of eight rockets had been fired from Gaza Tuesday, with six falling on Israeli territory and two intercepted by the Iron Dome, according to the IDF. 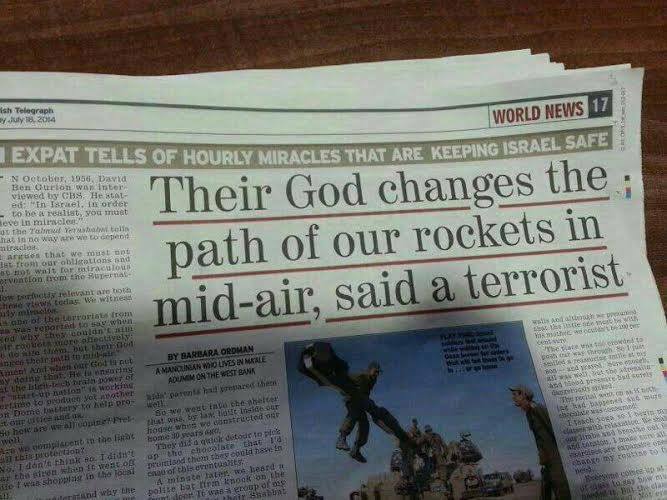 Meanwhile, the Times of Israel reported a senior officer in Israel’s army said divine miracles protected his soldiers during fighting in the Gaza Strip. Winter indicated a predawn raid intended to use darkness as cover was delayed, forcing the soldiers to move toward their objective as sunrise was approaching. With the troops in danger of being exposed at daybreak, Winter explained how heavy fog quickly descended to shroud their movements until their mission was accomplished. 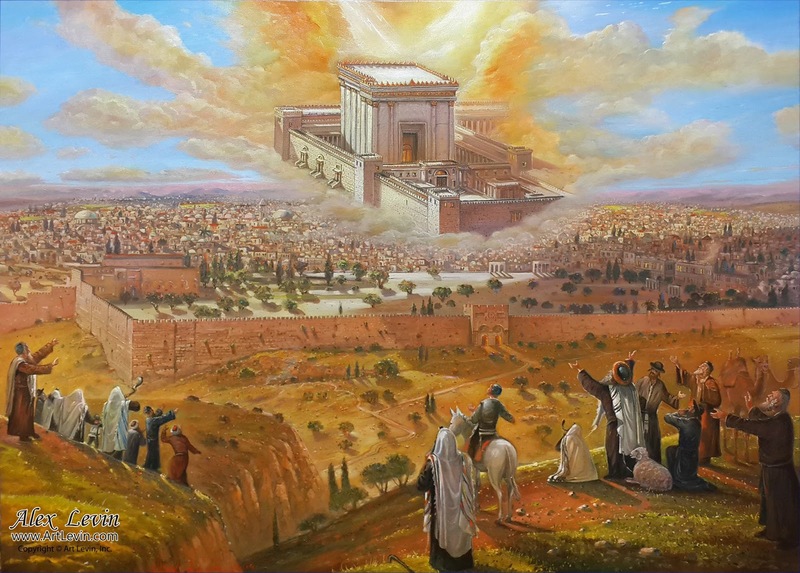 “Suddenly a cloud protected us,” he said, referring to clouds the Bible says guided the ancient Israelites as they wandered in the desert. “Clouds of glory.” Winter said only when the soldiers were in a secure position, the fog finally lifted. “It really was a fulfillment of the verse ‘For the Lord your God is the one who goes with you to give you victory,’” he said, quoting Deuteronomy 20:4. As Israelis were welcoming the Sabbath on Friday evening, Hamas terrorists had plans of their own, firing five rockets towards the south. 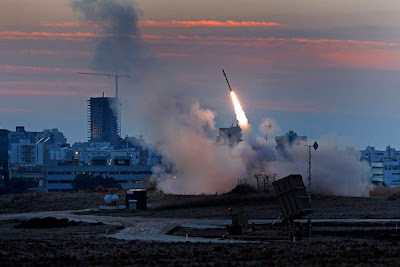 Two rockets were intercepted by the Iron Dome anti-missile system over the city of Netivot, two rockets exploded outside a community in the Eshkol region, and a fifth rocket exploded in an open area of the Sdot Negev Regional Council. There were no physical injuries or damages in any of the rocket attacks. 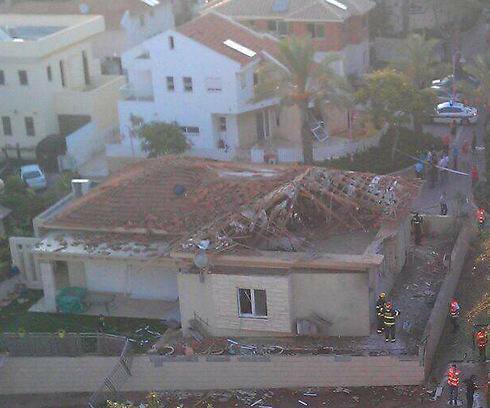 Earlier Friday, a rocket from Gaza directly hit a house in the city of Sderot. Miraculously no injuries were caused as the residents were out at the time, but significant damage was caused to the property itself, and police were called to deal with shrapnel from the rocket. 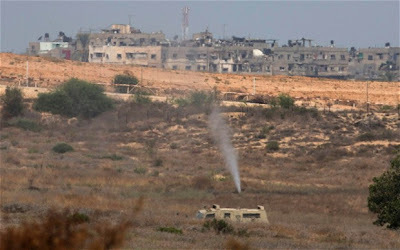 Heavy rocket fire from Gaza resumed on Friday morning at 8:00 a.m. sharp, when a 72-hour ceasefire ended. 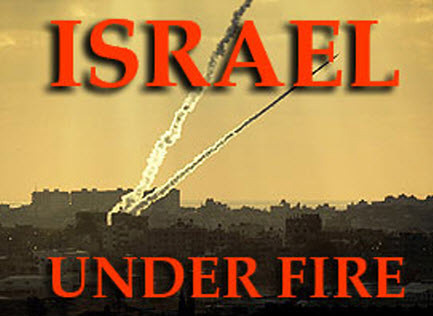 Two rockets were also fired towards southern Israel at around 4:00 a.m. Friday morning. Prime Minister Binyamin Netanyahu and Defense Minister Moshe Ya'alon authorized the IDF to retaliate with force to the rocket barrage. Het NOS nieuws begon vandaag met: "De beschietingen heen en weer tussen Israël en Gaza zijn weer begonnen." Daarmee de kijker met de suggestie wekkend en twijfel zaaiend, dat ook Israël weer eens begonnen zou kunnen zijn. Dit is de media hersenspoeling die continue aan u voorgeschoteld wordt. De waarheid is, dat Hamas vanochtend weer begonnen is met raketten op Israël af te vuren, waarbij een huis in het zuiden van Israël geraakt is, en er vandaag twee Israëli's door raketten gewond zijn geraakt. Daarna heeft Israël de vergeldings-bombardementen op Gaza wederom hervat! Wij zagen vanavond het RTL4 journaal, en we zijn erg teleurgesteld dat ook RTL meedoet aan het demoniseren en zwartmaken van Israël. We dachten dat RTL in de journalistiek iets beter zou zijn dan het linkse en liberale NOS journaal. 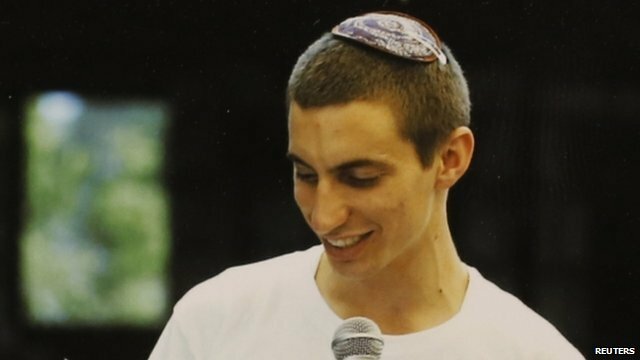 Ook RTL-Nieuws schildert Israël af als kinder-moordenaars. Men benadrukte heel sterk, dat door een Israëlische bombardement een tienjarig jongetje in Gaza was omgekomen. Je merkt een enorme ondertoon in het nieuws, dat Israël de boosdoener is van het hele conflict. De ware kindermoordenaars zijn echter Hamas en de pro-Hamas bevolking in Gaza zelf. De Hamas, omdat zij Israël, als islamitische Jihad strijders, willen heroveren voor de islam, en de islamitische ouders in Gaza die hun kinderen opvoeden met haat voor joden en Israëli's, en die hun kinderen leren om Jihad strijders te worden. Er is genoeg bewijsmateriaal, bijvoorbeeld op YouTube te vinden, die dit bewijzen! 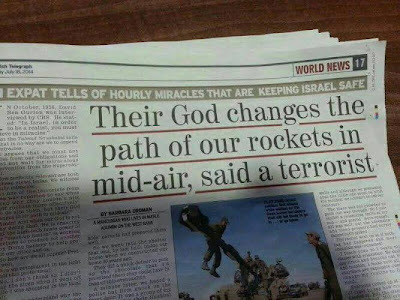 Die vaders staan zogezegd te huilen over hun dode kinderen, maar er zijn wel vanuit hun huizen katusha of grad raketten afgevuurd op Israël! Ook is er de laatste dagen bekend geworden, dat er ook veel kinderen in Gaza bij scholen om zijn gekomen, door raket afzwaaiers van Hamas zelf, maar daar hoor je het nieuws niet over! We are so thankful for these precious soldiers, who fight for our safety and with our love and prayer we can give them a hint of how thankful we are. The believers from the nations are such a surprise (since they thought the whole world hates them and here love is abundantly poured out on them), encouragement (their faith is mesmerizing and provoking them to a healthy jealousy) and empowering (our prayers build a wall of protection and strengthen their faith). One Israeli was killed and another six were wounded when a Palestinian Arab terrorist attacked a passenger bus with a large bulldozer on the streets of Jerusalem Monday afternoon. The attack occurred on the major thoroughfare dividing eastern Jerusalem from the western half of the city, very near to the Olive Tree Hotel. Witnesses believe the bulldozer driver was attempting to run over people waiting at a nearby bus stop when a passenger bus suddenly pulled up. Not wanting to miss his opportunity, the terrorist rammed the bus, flipping the vehicle on its side. Eyewitness video provided to Israel’s Channel 2 News showed that the terrorist attempted to continue his attack, when an alert police officer quickly opened fire, killing the bulldozer driver before he could do further damage. Most politicians do not read their Bible! Bij Eenvandaag gisteren hadden ze als 'deskundige' weer Bertus Hendriks van het pro- Palestina komité van stal gehaald. Dus vergeet het maar wat betreft een neutraal verhaal omtrent de strijd tussen het islamitische Hamas en de joodse staat Israël. Vooral zijn laatste opmerking stoorde mij enorm! Israël moest maar eens eerst een einde maken aan de zogenaamde blokkade van Gaza, en dan zal de rust en de vrede vanzelf komen, volgens Hendriks! Israël heeft jaren geleden de Gazastrook verlaten, en alle joodse nederzettingen zijn er destijds (volgens ons onterecht) ontmanteld, tegen de wil in van de Israëlische joodse bevolking aldaar. https://www.youtube.com/watch?v=Mm11qDwSVlk Daardoor is de Gazastrook autonoom geworden, dus ik vraag mij af over welke blokkade Hendriks het dan heeft? Dan is de volgende vraag aan meneer Hendriks: wat zou er gebeuren wanneer Israël de grens tussen Gaza en Israël volledig zou openen, met een islamitische vijand die tunnels aan het graven is onder de grens door, om joodse mensen te kidnappen, te gijzelen en te doden? https://www.youtube.com/watch?v=i08L09V0_sg Open de grens gewoon maar voor Hamas! 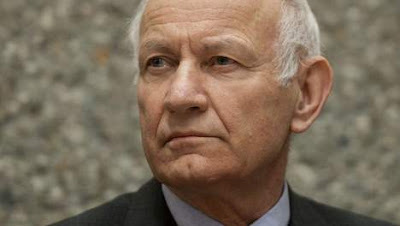 Vindt meneer Hendriks dat logisch? Zou hij dat alleen niet zeggen, wanneer hij misschien toch een aanhanger is van een groot Palestina, zonder Israël? Steunt hij daarmee niet bewust het islamitische Hamas terreur-apparaat? Ik wil meneer Hendriks feliciteren met zijn geweldige inzicht in dit conflict, en zijn fantastische adviezen aan Israël! French Jews are Leaving France! Please Pray for Them! Many Jews in Europe have many hardship recently. Many of them are leaving to Israel. 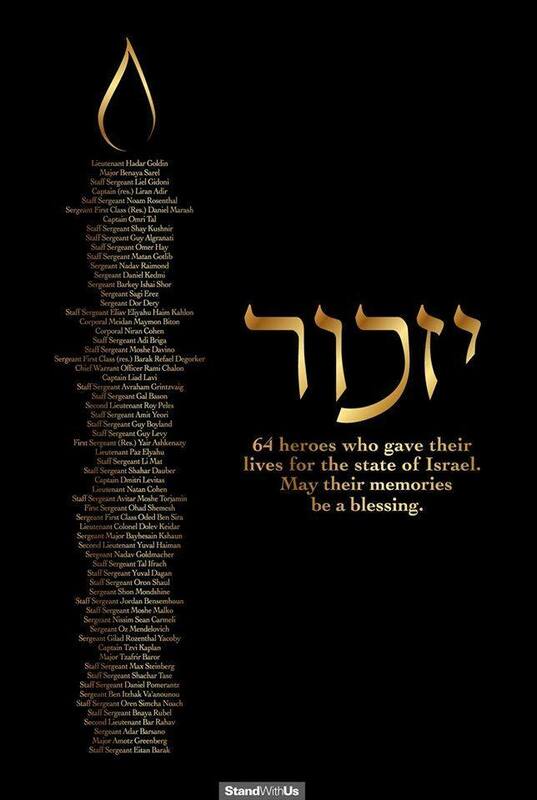 Please don't forget to pray for the Jews who live in Europe. Also pray for Israel. Various sources have received independent confirmation from inside Syria that these men were former Muslims that had converted to Christianity. They were not ‘..rebel fighters from a rival faction..’ as many news outlets are reporting. Each of the 8 men were charged with the crime of apostasy for renouncing Islam and converting to Christianity. 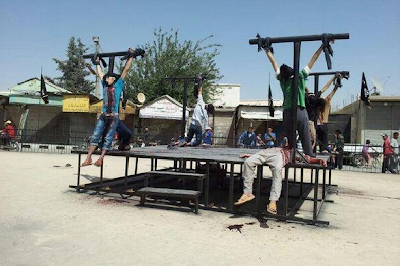 When confronted by the ISIS members, they refused to “revert” to Islam. This is the “only” reason they were crucified. According to Islamic jurisprudence, crucifixion is a method of death reserved for Christians. They do not crucify other Muslims. Voor de derde keer is bekend geworden, dat raketten waren verborgen in een school van de VN vluchtelingenorganisatie UNRWA, meldde een VN-woordvoerder dinsdagavond. De VN benadrukte dat 'daarmee weer het doel van een van onze faciliteiten is misbruikt'. De woordvoerder waakte ervoor, de Hamas=strijders te beschuldigen. Daarbij moet worden vermeld, dat de UNRWA-medewerkers bijna allemaal zelf Palestijnen zijn en bang zijn voor de radicale Hamasleiding. De VN-medewerkers hebben weliswaar beloofd dat ze dit geval zullen onderzoeken, zoals ze in de eerste gevallen ook hebben gedaan. 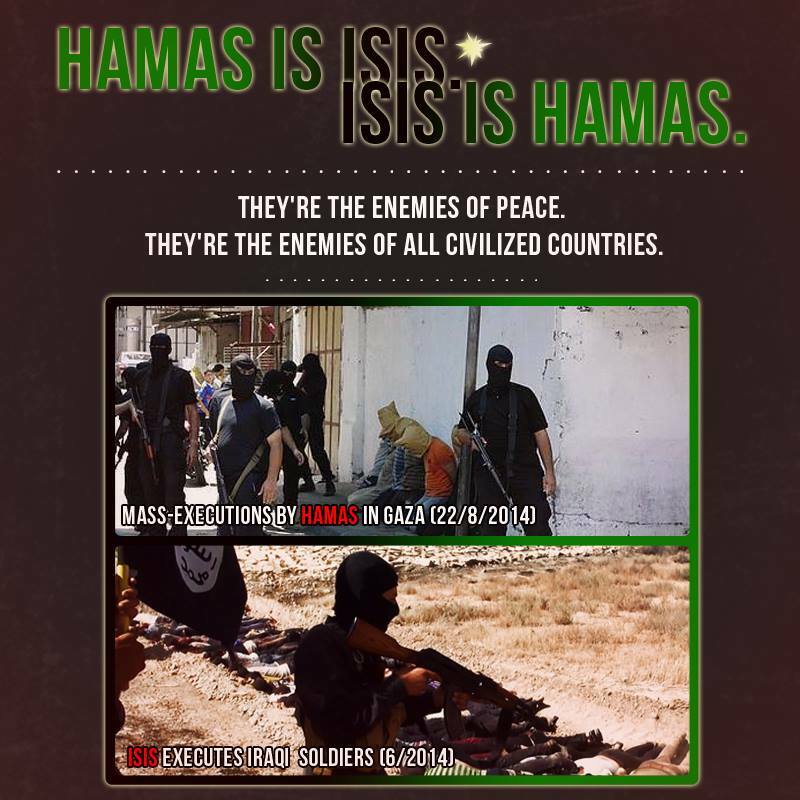 Maar tot nu toe heeft UNRWA nog geen klacht ingediend bij Hamas of Islamitische Jihad. Na de eerste vondst beloofde UNRWA om de in de school gevonden raketten aan de veiligheidsautoriteiten te overhandigen, maar in feite werden de 20 raketten doorgegeven aan Hamas, waarover Israël heeft geklaagd bij de VN. Wie de gang van zaken in de Gazastrook kent, weet dat niets anders te verwachten is dan dat deze gevonden raketten ook aan Palestijnse terroristen worden teruggegeven. De tussen de burgerbevolking verborgen raketten zijn gevaarlijk voor de Palestijnse bevolking. In de Gazastrook zoeken en vernietigen Israëlische veiligheidstroepen naar raketopslagplaatsen en lanceerinrichtingen. Dat brengt die Palestijnen in gevaar, die geen gehoor geven aan de oproepen van Israël om bepaalde huizen te verlaten. Een Vlaamse arts, die woensdagavond de telefoonlijn bemande van de wachtdienst van geneesheren weigerde om medische hulp te bieden aan een 90-jarige Joodse vrouw die een ribfractuur had opgelopen. “Ik kom niet! Stuur ze maar voor enkele uren naar Gaza, dan zal ze geen pijn meer voelen”, luidde het antwoord. De arts bekende kort daarna het verhaal en zei dat dit gebeurde in een “emotionele vlaag”. Volksgezondheid onderzoekt de zaak. Het was de zoon van de 90-jarige Bertha Klein die gisterenavond rond 23 uur belde naar de wachtdienst van geneesheren. Zijn moeder verkeerde in felle pijn nadat ze een ribfractuur had opgelopen. De arts wist al snel dat het om een Joodse patiënt ging, de naam en het adres in Antwerpen verraadden dat al, evenals het accent (Klein is Amerikaan). Toen de familie vroeg of de dokter niet kon langskomen om de vrouw van de vreselijke pijn te helpen antwoordde hij botweg “Ik kom niet”, en legde de telefoon neer. De familie belde meteen terug, daarop zei de arts: “Stuur haar maar naar de Gazastrook voor enkele uren, daarna zal ze geen pijn meer voelen”. De familie was in shock en belde ondertussen naar een vriend, Samuel Markowitz, districtsraadslid in Antwerpen voor de Open VLD. Markowitz is daarnaast ook ambulancier en weet dat een arts nooit een patiënt mag weigeren. 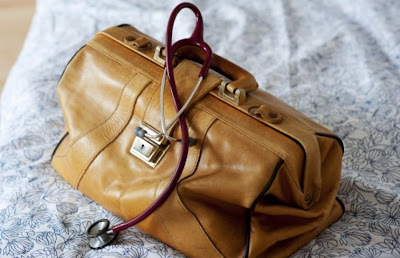 Hij belde zelf naar de hulplijn en confronteerde de dokter met zijn uitspraken (het gesprek werd ook opgenomen voor later bewijs). De dokter bekende de feiten en zei dat dit gebeurde in “een vlaag van emotie”. Markowitz lichtte het hoofd van het departement Volksgezondheid voor de regio Antwerpen in terwijl de kleinzoon van de 90-jarige vrouw, Hershy Taffel, een klacht neerlegde bij de politie voor racisme en xenofobie. Meneer Taffel vertelt hoe zijn grootmoeder in tranen uitbarstte. “Dit doet mij denken aan wat wij in Europa ondergingen 70 jaar geleden, ik had nooit gedacht dat die dag ooit nog zou herhaald worden”.